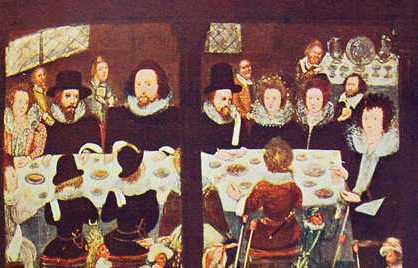 Detail of a painting of the marriage feast of Sir Henry Unton. Reproduced in Social England, ed. H.D.Traill. University of Victoria Library. Illustrated here is a Renaissance banquet prepared as part of a wedding feast. The complete painting includes the elaborate entertainment provided by a masque and musicians. In contrast, Queen Elizabeth, especially in her later years, ate alone, or with some few of her ladies. A full two weeks of Christmas celebrations at court were overseen by the Master of the Revels. They included banquets, music*, masques and jousts--and many of Shakespeare's plays. Click for a video* of a masque dance. The court spent Christmas at Whitehall, unless plague was raging in the city. It was customary to give presents to the sovereign on New Year's Day, and Elizabeth loved receiving presents, although she herself was unlikely to give in return. Gifts given to Elizabeth included a silk purse containing twenty "dimy soveraignes," costly jewels* from courtiers, finery and "sweet bags" from the ladies of the court, a "pott of grene gynger, and a pott of orenge flowers" from the court apothecary and "a greate pye of guynses and wardyns [ginger and wardens] guilte" from the Sergeant of the Pastry. Wardens are a variety of cooking apple. One way that revels at Court defused the omnipresent, and often oppressive, emphasis on the established order was by appointing a Lord of Misrule for one day a year. For one day the first were last, the last first, and all celebrated. The festival probably goes back to the Roman Saturnalia, and beyond--one of many remnants of paganism enjoyed by the Elizabethans, but increasingly frowned upon by the church. Henry VIII wrote music for his various wives and mistresses, and Queen Elizabeth was proud of her skill in dancing-- demanding the same from her courtiers. Courtly dances ranged from the sprightly to the sedate. The music of the Court. Henry VIII fantasizes. This short piece is a "Fantasie" composed by Henry VIII. The Earl of Leicester gave Elizabeth "a very fair jewel of gold, being a clock full furnished with small diamonds and rubies: about the same are six bigger diamonds pointed, and a pendant of gold, diamonds, and rubies, very small; and upon each side a lozenge diamond and an apple of gold enamelled green and russet." This vigorous dance, accompanied by a "fiddle," is part of a re-creation of Ben Jonson's masque Oberon, performed at Case Western Reserve University.